Another year brings another list of my favourite cookbooks. 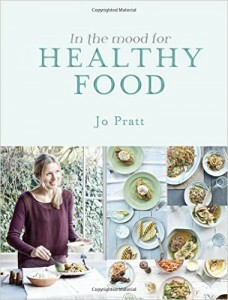 Jamie, Nigel and Nigella have all got new books out in 2015, Ottolenghi brought out another volume and Bake Off continued to inspire a clutch of recipes. If you’re looking for a cookbook gift for that foodie someone in your life, you could do worse than buying one of these! Last year, MiMi’s Noodle was my pick of the year. It seems only right that torch is borne by Noodle Kids! 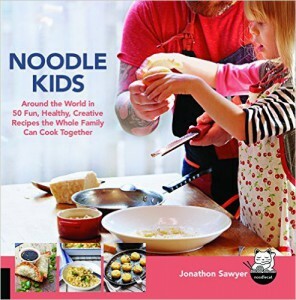 It’s an absolute charmer of a book, using the loose American definition of ‘noodle’ to take in pasta. But the recipes are delightful, suitable for the whole family and actively encouraging them to get involved. It’s created a wonderful new staple in our house: the “noodle party”, where you lay out lots of lovely meat, vegetables and condiments along with some freshly cooked noodles and broth. Then everyone piles in to make their own personalised bowl of noodles. Great communal food. The book is peppered with cheeky asides offering tips to mini-cooks in the kitchen. A very cute buy. This is the book I have cooked more from than any other. It’s been a constant presence in my cookbook stand and despite the ‘healthy’ tag the recipes are packed with flavour and fun. There’s lots of great, sensible substitutions helping to cut down on your meat intake and replace with vegetables. It’s helped me make great tasting meals that lose nothing from their fattier versions: wonderful seed-and-lentil-packed meatballs, creamy yghurt dressings and wonderful ragus. A delight to cook from. I’ve been following J. Kenji Lopez-Alt for years. Through his Serious Eats column I’ve joined him on many madcap experiments finding the ultimate cookie, the best brining methods and stupendous air-fried chicken. He’s an inspiration. This quote distills everything brilliant about The Food Lab book. It’s less of a recipe book (although it has plenty of those) and more of a exploration of why cooking techniques work. If that sounds hopelessly nerdy, that’s because it is. And superb because of it. Discussions range from stainless steel woks to microwave radiation, from ceramic knives to egg cooking times. 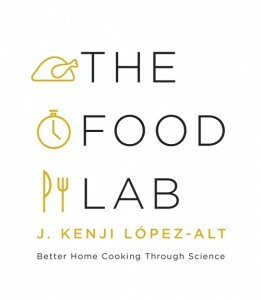 Much in the way Heston does with his books, J. Kenji Lopez-Alt’s book forces you to think about the processes you carry out when preparing your favourite meals. In this, you can improve them no end, and decide for yourself how hot the water needs to be for pasta, or why meat caramelizes at certain temperatures. If you want to be a better cook – not just the one with the most recipes – this is the perfect book. That was my year in cookbooks – what were your favourite books this year? Really love your blog! Found it through eatyourbooks.com best UK blogs of the year! Do you do this for your living or do you have a daytime job too? Thanks for the comment Foof. This food stuff is just a hobby.